The Katimavik-Hazeldean Community Association: Welcome! Your neighbours in Kanata, Canada... Keeping Neighbourliness Easy! All residents of Katimavik-Hazeldean are encouraged to become members of the KHCA. We are YOUR community association. Members can vote on resolutions brought forward to better our community. Join your neighbours and make a difference! Welcome to the Katimavik-Hazeldean Community Association! Thank you to all those who attended our busy meeting on April 1, 2019. 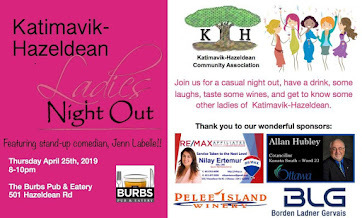 We have a Ladies Night Out coming up on Thursday April 25th (see the poster on this page), a big Kanata Garage Sale on Saturday June 1, and we will be joining the Katimavik ES/Castlefrank ES BBQ near the end of June and Canada Day in Kanata (offering up fun stuff! ), and a family movie night (and so much more!) in the park in late August/early September. 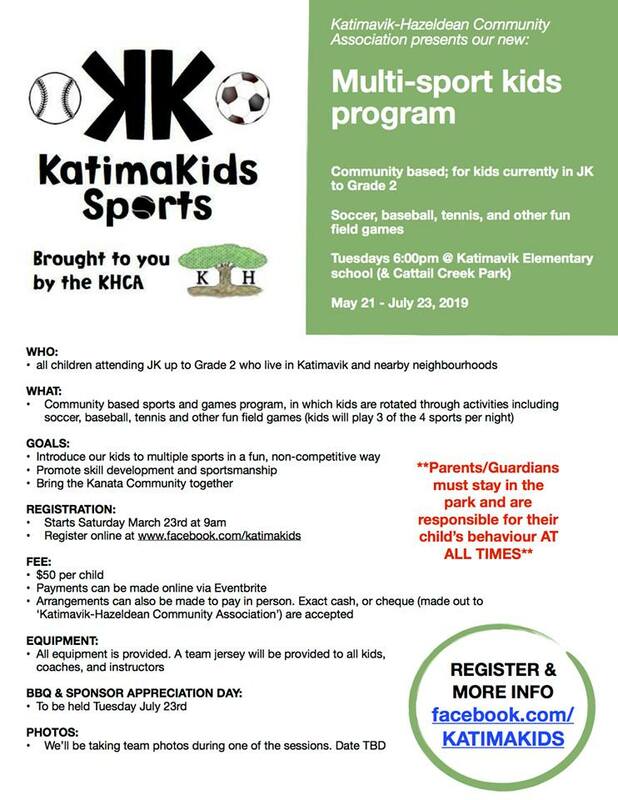 Registration for our popular Katimakids Sports program is now open (see the poster on this page). We are also developing a new website, new financial rules, revamping our bylaws, and are in the midst of our yearly corporate fundraising drive - all at the same time! Our next KHCA meeting will be held at 7:30 pm on May 6, 2019 in the Kanata Recreation Complex off Terry Fox Drive. Public Notice: We will be voting on significant changes to our bylaws at the May 6 meeting (please click on the "Future Meetings" tab above), and we are also planning to unveil our new website. All residents of Katimavik-Hazeldean are invited! Why not sweep up the grit that is lying on the pavement near your house after the winter? Put it into buckets and then use it next winter on your walkway and driveway. Save the environment and your money by not having to buy more grit next year. And it helps clean up our city! 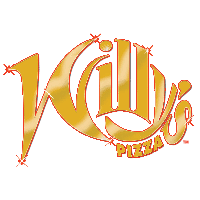 Local Businesses that are Supporting the KHCA in 2019. Please give them your business! Thank you Meridian Credit Union! 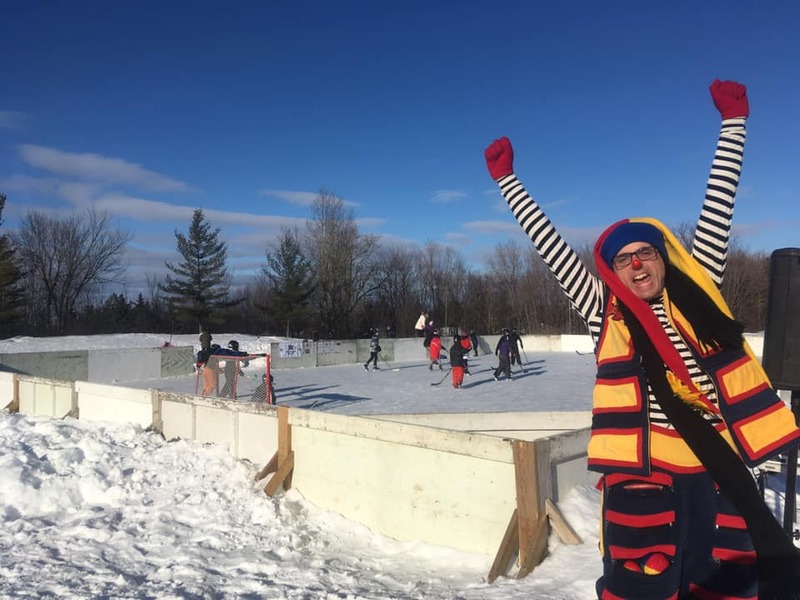 Thank you to Hazeldean TD for supporting our Katimakids Sports program! 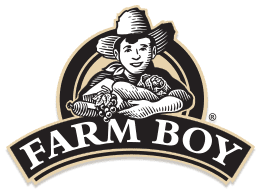 Thank you to Katimavik Food Basics for consistently donating and helping your community! They helped us last year, and this year they are doing even more! Thank you! A new Kanata business and already helping our community! Thank you, Laura's Independent Grocer Hazeldean Mall. Year after year you always help out the community in so many ways! 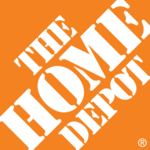 Thank you for partnering with us for neighbourhood improvements, Kanata Home Depot! KHCA. Theme images by konradlew. Powered by Blogger.